Deep breath: a dive into the water, immersed in something alien, and yet familiar. 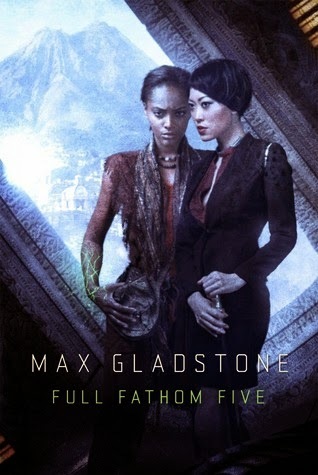 This is the best I can summarize Full Fathom Five, an inventive fantasy that had me riveted, fighting the need to finish the story so that I could just stay submerged a little longer. It begins with a professional priest, Kai, diving into an infinite pool in an attempt to rescue a drowning idol. Or maybe she’s a goddess–Kai is no longer sure–perhaps the division between her work with idols and the forbidden worship of gods isn’t as clear as she thought. Her superior, Jace, and friend, Mara, witnessed Kai’s jump and do not believe Kai heard the idol speak. Kai’s injuries, both spiritual and physical, result in a prolonged convalescence and the loss of her prior position in the order. In another part of the island, Izza, a fifteen year-old refugee and street thief, is refusing to take lead of her rag-tag group of urchins. The oldest child usually becomes the ‘priest’ of the group, leading and providing solace through stories about their god, but Izza doesn’t want the responsibility. In a moment of compassion, Izza rescues a foreigner, clearly a representative of a god, and thus forbidden. The island Kavekana is one of the few places in the world that has maintained its independence in a world beholden to the power of the gods or the Death Kings. Like a fantasy Switzerland, religious neutrality has financial and power implications; their neutrality has allowed them to sell idols and priests who act as religious savings accounts, allowing owners from other countries to protect, hide, or leverage assets. And, like Switzerland, there will come a time when circumstance will force the island to declare itself, no matter how much the island priests want to maintain independence. Characterization was done well, particularly considering there was a range of character age and experience levels. Characters were people, not tropes, most clearly demonstrated in the ambivalence and sympathy for the characters working against the leads. I enjoyed Gladstone’s characterization of women in the story–they were well-rounded people, not sexualized props. It is also worth noting that one character is transgender, part of a larger idea of identity, and not mere inclusion for Serious Issues or tokenism. “Mapping her scars, she imagined her next trip to the beach, once she’d healed. What happened to you? the boys and girls would say. Narrative alternates between Kai and Izza, in a third person format. Each section tells the story, in basically linear fashion. The straightforward structure contrasts nicely with the sophistication of the world-building. There’s very little telling here; since the fantasy elements of gods and soul-coins contrast with the urban fantasy feel of tequila shots and poetry slams, it helps to have a linear narrative while the reader pieces the world around them. Some reviews note plotting was slow; I’d disagree, arguing that the action-driven plot of many books and movies has left us with difficulty appreciating the slow build. Like going for a swim, I know there’s a gestalt experience at the end that will make plodding to the pool and jumping into the cold water worth it. The pleasure is in the warmth through exertion, the thoughts examined in silence, the deep breaths of air, the laughs, the weary muscles at the finish. On the other hand, while I had a a few suspicions where the plot was heading, Gladstone was still able to surprise me with his twists. He really is a clever writer; normally, I focus more character, avoiding thinking too hard about the world politics, but he slips major concepts like religious orders and power brokering in and all of a sudden, I understand the issue. The personal is political, and its a sharp writer who can make that clear in a book without long blocks of text which my eyes have a sloppy habit of skimming over (tl;dr, which I only recently learned stands for ‘too long, didn’t read.’). Somehow, there’s a balance between the smalls steps our characters take as they set down the path to fundamental change, giving a greater appreciation for the struggle and betrayals. This is the third book in ‘The Craft Sequence.’ Gladstone is doing extremely interesting things with this series, essentially creating each book as a stand-alone story. To date, the books have been set in different areas of his world. In the case of Full Fathom Five, I’d recommend Three Parts Dead (review here) be read first, as historical references that play a role in this book are best explained there, along with the reappearance of three characters, one or two who are farther in their own development arcs. It isn’t strictly necessary, but you’ll catch the deeper currents that way. If you are a fantasy fan, particularly of Zelazny’s mesh of inventiveness and language, or Martha Wells’ imaginative world-building, or Liz Williams’ Detective Chen melding divine, urban and fantasy worlds, I strongly suggest you check The Craft Sequence out.